I woke Saturday morning to a very heavy frost and discovered the low (forecast to be 27) had dropped to 18. This is an extremely cold snap for not-even-Halloween --- for the sake of comparison, last year we didn't get down into the teens until the beginning of December. 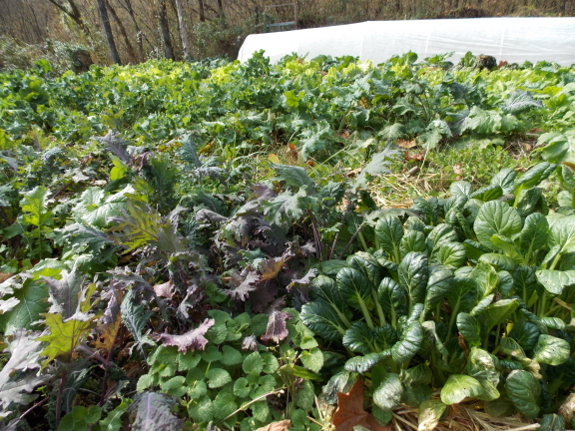 If I'd realized it was going to descend this low, I would have done a lot of prep work --- covered up a lot more plants (like Asian greens and early lettuce and maybe even Brussels sprouts) and plugged in the heated chicken waterers and the light bulb in the fridge root cellar. By the time the frost melted, I was outside, worriedly checking for damage. In the process, I found out that soil temperature is much more important than air temperature for a lot of these issues. 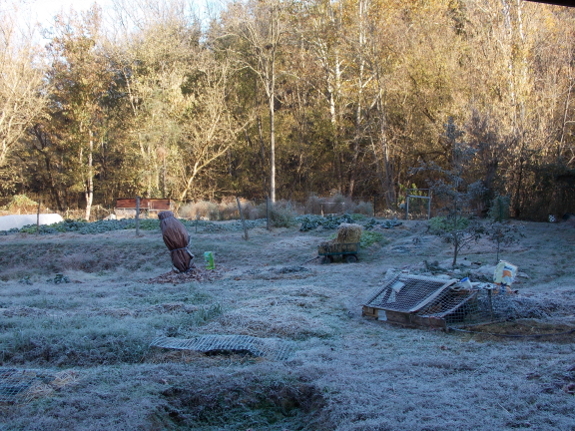 Yes, the chicken waterers were frozen, but the plants and fridge root cellar mostly weren't. 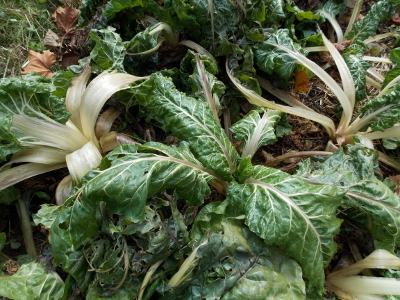 The earth is still pretty warm from summer sun, so a low that would have killed most uncovered plants in February just nipped back the Swiss chard, tokyo bekana, and oilseed radishes a bit, with everything else thriving. The fridge root cellar only dropped to 39 degrees, perfect for the carrots and apples therein. The one thing I did learn was to start subtracting nine degrees, rather than five, from our local weather forecast. Our movie-star neighbor has started calling our farm Little Alaska since we always get significantly colder weather than his mid-south-facing-slope does, even though we're less than a mile and a half away (as the crow flies). He only saw lows of 23 during our cold snap, but guessed we would have gone down to 20. Little did he know, it gets even colder than that here. Same here - we are at least 10 degrees cooler and Portland gets wind through the Columbia Gorge and that keeps the temps up during frost events, and gives them a wind chill during the winter months that we don't get. So sometimes colder and sometimes warmer. 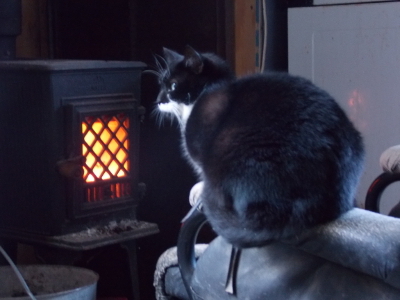 We've yet to get our killing frost, soon I think.